Madame Victoria is a novel in stories. It begins in 2001, when a woman’s body is found in the woods near Montreal’s Royal Victoria Hospital. In spite of forensic and legal investigation and a public appeal, she remains unidentified. Only a handful of details emerge. The skeleton is two years old. It belongs to “a Caucasian woman of about fifty suffering from osteoporosis and arthritis-ridden joints but showing no signs of violent death.” Time passes. No one knows this woman, in spite of repeated searches. Who is she? Catherine Leroux offers 11 “Variations” on a possible life. Who is the woman who died in the woods, within sight of a major hospital, in the middle of a major city? “Victoria Outside” is genuinely heartbreaking. A young woman from rural Quebec has a child out of wedlock. Alone in a wretched town on the Gulf of St. Lawrence, the child becomes her whole life. But her physical health is failing, and her mind drifts even before the baby dies. Claustrophobia dominates this story. The town in the middle of undeveloped country feels too small. The house itches against “Victoria’s” skin. This sequence is a story of homelessness. Victoria’s sanity is long-dissolved, but she still looks for her baby. If the winter fails to bother her, it’s only because she’s beyond worrying about her own life. Time ceases to have meaning. One morning, she awakens “feeling that forty years have just elapsed.” She’s old now, still convinced she’s pregnant, dying of cancer and desperate for the outdoors. It’s not a short story in the conventional sense. “Victoria Outside” is a life, moving toward its end without particular regard for fiction conventions. The heartbreak is real, but it plays out at a distance. Victoria can’t be tragic because nothing that happens is really her choice. Her losses and her madness simply occur. Then she dies. Leroux’s purpose might be to remind her readers that even Canada, with its veil of goodness, is ultimately a society that turns its face away from pain. It’s a crucial idea. Except that Leroux isn’t writing about “Canada;” she’s writing about Quebec, the odd country-within-a-country that maintains its own culture and history within the larger nation’s borders. Nothing beyond the boundaries of Quebec is real, here. If other places exist, they’re incidental. When people arrive in Montreal, they have arrived in the center of the uncaring universe, for better or for worse. The first-person narrated “Victoria on Borrowed Time” has more emotional weight. Young Victoria comes to live with her boyfriend and his family, all of whom adore her. But her boyfriend is hyper-sensitive and fragile. He lures her into a suicide pact that she survives. Left at the center of a family with its heart ripped out, Victoria walks through her life in the suspicion that she is already dead. Death is waiting, inevitable. The book’s premise makes all endings inevitable. Victoria dies every time. The frustration of that pattern echoes the frustration of the investigators who drift through the book, never able to put a name to the dead woman’s corpse. History repeats itself and repeats itself without ever revealing anything useful. Leroux’s premise neatly side-steps what should by rights be the book’s center. Canada (and Quebec is part of Canada, no matter how thoroughly Leroux ignores that fact) is in the midst of a crisis of missing and murdered women. Those women, though, are Indigenous, and Leroux willfully excludes Indigenous women from her range of possibilities. Oddly, as though she can throw a veil over questions of race and representation, Leroux includes an odd Victoria out: a slave girl in 18th century Montreal. “Victoria in Love” shows some historical interest, but little character depth. This Victoria is naïve to the point of absurdity. She seems genuinely surprised by the unfairness of slavery, in spite of its being the defining force of her life. With so many excellent slave narratives available, and strong fiction about enslaved women written by black authors, Leroux’s contribution feels like an editorial oversight, segment that should never have reached print. Why not, then, a single Indigenous Victoria? When the story can leap into the deep past or the far future? When Leroux’s possibilities encompass science and magic, post-apocalyptic faiths, and literal vanishing women? It’s somehow entirely typical, both of the country and its literature, to accept enchantment but resist Indigenous inclusion. 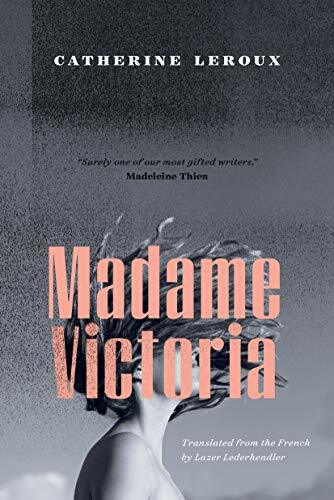 In this sense, Madame Victoria repeats the erasure it seeks to remedy: it makes invisible women more invisible, even as it seeks to reveal their humanity. Annette Lapointe is a staff reviewer at New York Journal of Books.